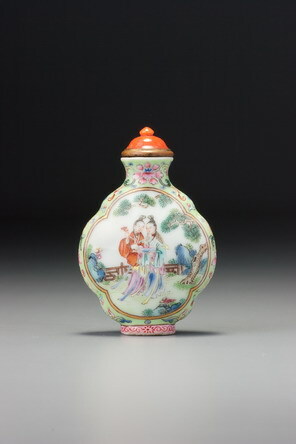 This was presumably made as a birthday gift, the symbolism predominantly relating to longevity. The Immortals represent this idea, for obvious reasons, as do the lingzhi with which they are so often associated. The peaches evoke the Peaches of Immortality grown in the garden of the Mother Goddess of the West (Xiwangmu). The cypress, like the pine, lives to a gnarled old age, and rocks of any kind both represent the same wish; even the narrow-side pattern of formalized floral scroll can be read to signify the same desire because of its elongated nature that, around the footrim, becomes continuous, representing life without end. For comparable bottles, see Treasury 6, pp. 552 – 553. This shape is one devised during the lifetime of the Qianlong emperor, probably during the latter part of his reign. There is a boxed set of twenty in the Imperial collection in Taipei of the same shape, but with flowers and poems (Chang Lin-sheng 1991, no. 74). The reign mark on the National Palace Museum set does not help us to propose a date relative to the emperor’s abdication, since it uses a rare variant in which the lower-left quadrant of the character Qian does not resemble an ‘S’ either way around (see under no. 1177); we can say that this variant occurs later in the reign, but the significance of its use, if any, is unclear. 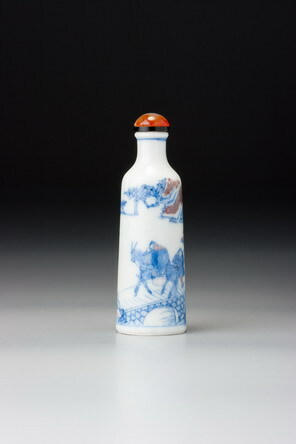 The original type of stopper for these bottles seems to have been a matching porcelain one, imitating an Imperial or official hat for formal dress, but it is here replaced by a lovely old coral stopper of the same shape; it matches the bottle well, but suggests that the bottle was in circulation long enough to lose its original stopper, a common enough mishap.